Where You Want to Be. 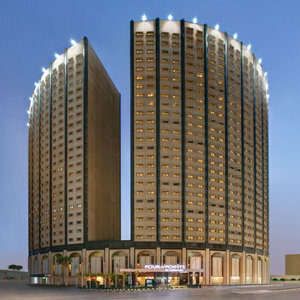 Conveniently located in the city center, the Four Points by Sheraton Riyadh Khaldia is close to major corporate and government offices, as well as the Olaya financial district and the Riyadh International Convention & Exhibition Center. The famous souk and other shopping venues are within walking distance of the hotel. King Khalid International Airport (RUH) is a 35-minute drive away. Experience Our Simple Pleasures(SM). Stay connected with free wireless High Speed Internet Access throughout the hotel, or in our 24-hour business center. Unwind in the hot tub, sauna, steam room, or our expansive sports facilities. Start your day with a good breakfast at Al Nakheel, our all-day dining restaurant, or take in the 26th-floor views from Panorama Restaurant. The Comforts of Home. Each of our 240 guest rooms has everything you need for a great stay, plus free extras like High Speed Internet Access and bottled water. After a long day of business or sightseeing, relax in front of the flat screen TV or get a good nights sleep in the plush Four Points by Sheraton Four Comfort Bedâ¢.